KNOWN AS BOTH the Tar Heel State and Old North State, North Carolina was part of colonial America. Like its sister state SOUTH CAROLINA, North Carolina was named for Kings Charles I and Charles II of England. North Carolina is bounded on the north by VIRGINIA, on the south by South Carolina and GEORGIA, on the west by TENNESSEE, and on the east by the ATLANTIC OCEAN. 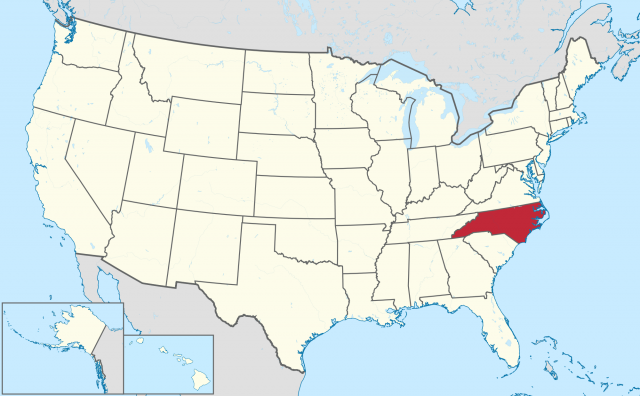 The total area of North Carolina is 52,669 square mi (136,412 square km), making it the 29th state in size. North Carolina ranks 11th in population among the 50 states. North Carolina’s largest cities are Charlotte, Raleigh (the capital), Greensboro, Durham, Winston Salem, Fayetteville, Cary, High Point, Wilmington, and Asheville. The climate of North Carolina is varied. In the Atlantic Coastal Plain and the Piedmont Plateau, the climate is subtropical, while in the Blue Ridge Region the climate is humid continental. In the higher, mountainous elevations, cold winters are followed by relatively cool summers. North Carolina winters are mild in the Piedmont Plateau and Atlantic Coastal Plains, since mountains protect the area. While rain falls throughout the year, it is more prevalent in the late winter and in summer. Snow is frequent throughout the Blue Ridge Region. North Carolina’s coasts are often subject to hurricanes, but the interior can be struck as well—in 1989 Hurricane Hugo wrecked havoc on the inland city of Charlotte. Tornado season also poses a threat to the state. with Virginia’s Chesapeake Bay. The Dismal Swamp Canal is the oldest man-made canal in continual operation in the United States. Albemarle Sound as well as Pimlico Sound are located between the mainland of North Carolina and a group of offshore islands known as the Outer Banks, which include the islands of Cape Hatteras, Cape Lookout, and Cape Fear. The Piedmont Plateau, with its moderately fertile soils and low elevations, comprises an additional two-fifths of North Carolina. This area is separated from the Atlantic Coastal Plain by the Fall Line where rivers descend, creating rapids and waterfalls as the two geographical areas converge. The remaining fifth of North Carolina makes up part of the Blue Ridge Region of the southeastern United States. The North Carolina section of the APPALACHIAN MOUNTAINS includes both the Blue Ridge Mountains and the Great Smoky Mountains, containing more than 200 mountains with elevations of more than 500 ft (152 m). These mountains tend to be round in shape with steep gorges. The area also has a number of basins such as the one located in Asheville. Roads and tunnels provide access along the Blue Ridge Parkway. The Great Smoky Mountains, part of the southern Appalachian chain, hosts a national park where park officials have identified over 10,000 plants and animals in the area and believe that another 90,000 species have yet to be identified. Forests of shortleaf, longleaf (the state tree), loblolly, and Virginia pine are prevalent throughout North Carolina’s section of the Southeastern Pine Forest. Cypress and various hardwoods are found in wet areas of the state. Oak, hickory, tulip, and poplar are common among the lower slopes of the Blue Ridge Region, while the higher slopes are home to birch, beech, maple, and hemlock. Spruce and balsam are found in the highest regions of the mountains. North Carolina flowers include rhododendron, azalea, camellia, dogwood (the state flower), and orchid. Animals found throughout the state include Virginia deer, opossum, raccoon, squirrel, and fox. Black bear are common in the Coastal Plain forest and in the Blue Ridge Region. The North Carolina coast serves as a home to migrating birds such as ducks, geese, and various waterfowl. The state’s numerous songbirds include cardinal (the state bird), blue jay, woodpecker, Carolina wren, mourning dove, purple finch, and towhee. The economy of North Carolina was heavily dependent on agriculture until the 1920s. At that time, the manufacturing of textiles, furniture, and tobacco products became the mainstays of the economy. Tourism bolsters the North Carolina economy by approximately $1 billion a year. By the 1990s, agriculture and forestry also assumed significance for the state economy. Major farm products for the state include tobacco, corn, cotton, hay, soybeans, peanuts, wheat, sweet potatoes, and various other vegetables. Industries include metallurgy, chemicals, and paper. North Carolina’s most important minerals are quartz, limestone, phosphate rock, sand and gravel, granite, feldspar, talc, lithium, mica, asbestos, and gemstone. North Carolina is the country’s leading producer of mica and lithium. The quartz found in the Blue Ridge Mountains is used in microprocessors throughout the world because of its unusual purity.